Make your dear ones feel special, gift this finest quality air tight acrylic jar to them. 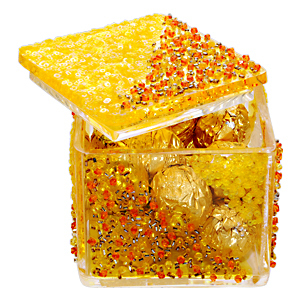 This jar is made up of yellow colour acrylic painted with glass colours and has been decorated with sequins and small crystal stones. A beautiful glassware, this is an ideal jar or storing cookies and dry fruits. Your loved ones in all cities in India will surely love this gift. Team this item along with other exclusive Gifts across India and send through GiftsAcrossIndia.com. Come in other appealing Colors. Orange, Blue, Magenta. P.S: The Chocolates shown in the picture are indicative and the Jar will be delivered without the same. Sequins & stone colour may vary due to availability of the products. Shipping Info : Ships within 7 - 10 working days.